Grilling | Om nom nom! We always make enough for for an army on Easter, and we were very excited to actually host it this year! We decided to do somethings besides ham, since that’s not everyone’s thing, and a leg of lamb sounded great. The problem for us is that our oven is not that big – a ham and sides and we’re done. This was perfect as it was meant for the grill. 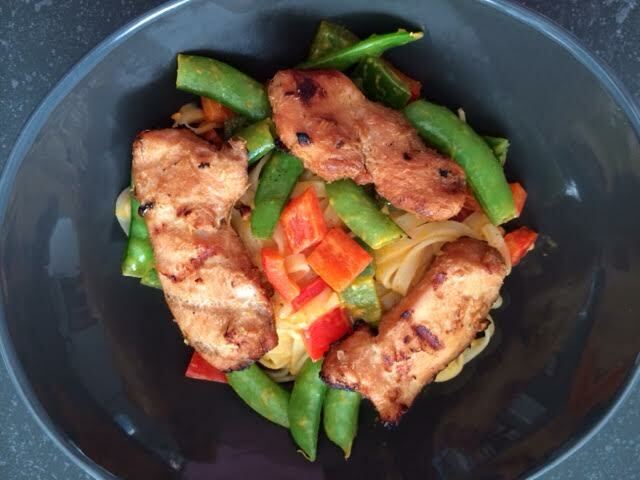 We really enjoyed it, and it was not only easy, but surprisingly quick to cook! We got this from an old Gourmet magazine. 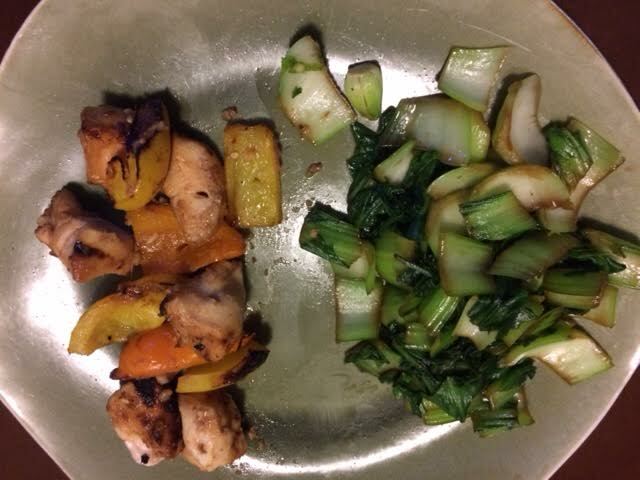 Only changes made were that we did not use the skewers described in the recipe, and we marinated overnight. 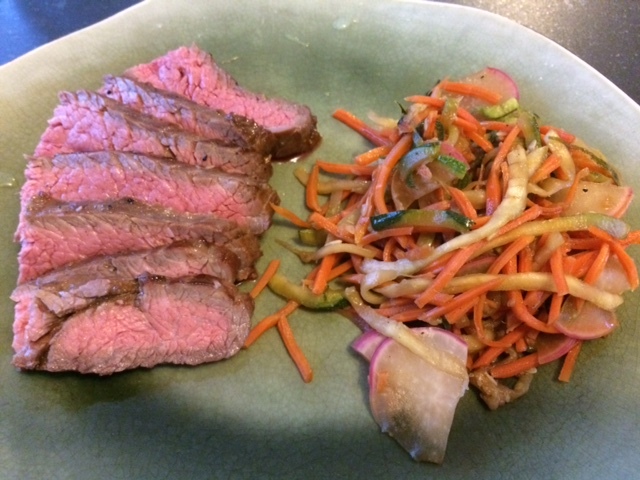 This was an easy and tasty modified Cooking Light recipe – modified because I marinated it for 8 hours, rather than putting sauce on it and cooking it. 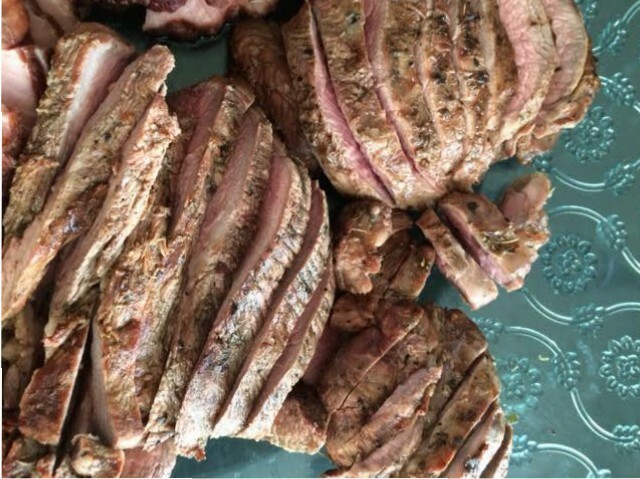 Being a flank steak, I was skeptical of how tough it would be if it had no marinade at all. This came out well, especially because Shawn grilled it – thank goodness we’re getting back to grilling weather! 🙂 We had this with spiral zucchini, carrots, and radishes as a “noodle” side, tossed with some soy sauce and black vinegar. I received a Food Network Magazine subscription as a gift, and it does have some very fun (if caloric) ideas. I saw this flank steak on skewers idea and thought we could definitely do something with it, with some tweaking (and it happened we had a flank steak around 😉 ). We really like this! We used a marinade from Serious Eats, and a Chimichurri from Chow, and there you have it. 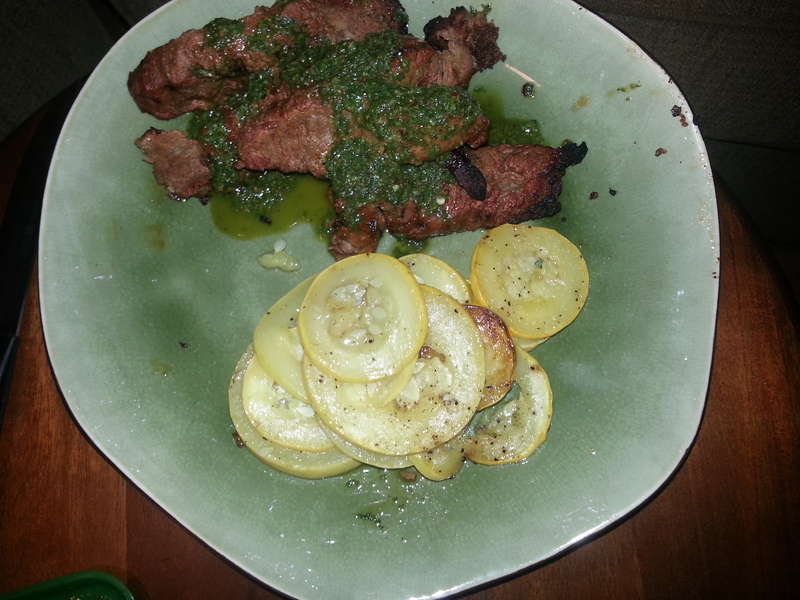 Flank steak was pretty tender and flavorful and the Chimichurri was great and used up herbs from our garden. 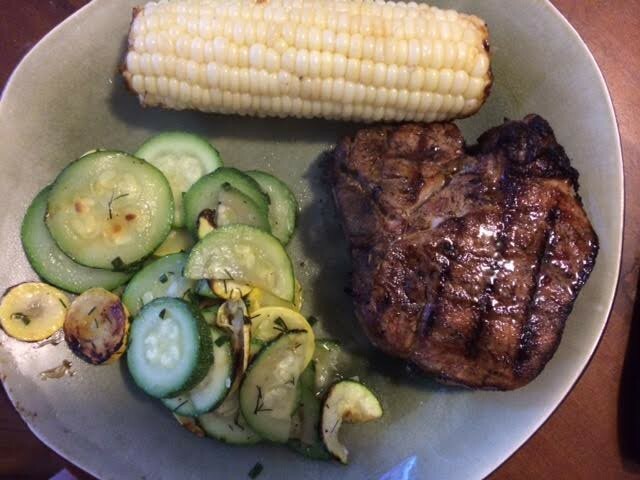 We served this with our summer squash as a side – great, fast dinner that I was able to prepare ahead of time and Shawn could grill while I finished with the horses (aka got home late). A win-win! This was another grilled pork chop recipe (and we have yet to tire of grilled pork chops!) that we liked a lot. Very easy for a weeknight dinner. There were no bone-in chops at the store, but the thick boneless were actually fine. I did do a quick brine of these before the herb rub/grilling. 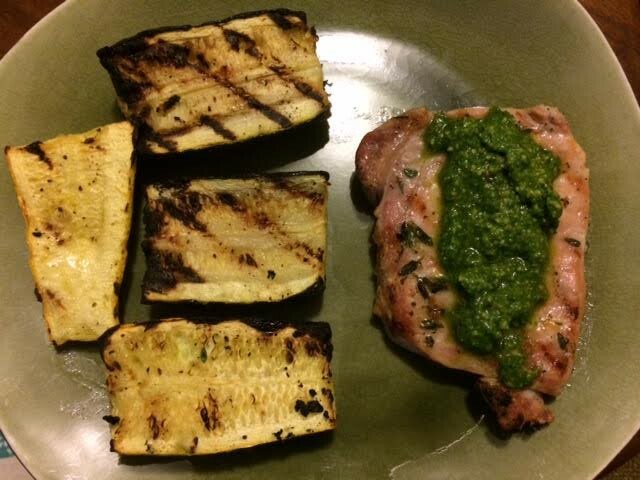 The pesto was from our basil, and we grilled some of our squash as a side. This came from Serious Eats. My friend Missy recently had a big party to celebrate a decade in DC – it was an awesome time with amazing DC food! She had a Banh Mi station with lemongrass chicken. I used her recipe and threw it over some lightly Thai curried noodles for a pretty good dinner. The sauce was a good base but could use some brightening up…maybe more lime or fish sauce next time. The best part was that we used our own sugar snap peas from the garden!